Theatre Is Easy | Reviews | Fiorello! Austin Scott Lombardi in Fiorello! Photograph by Alexander Hill. BOTTOM LINE: Originally performed in 1959, this story of New York Mayor Fiorello H. LaGuardia struggles—and sometimes succeeds—in finding relevancy nearly sixty years later. Berkshire Theatre Group’s Off Broadway revival of Fiorello! has found its home at the 13th Street Theater (home of Classic Stage Company). Upon entering the space, even the most uninformed of audience members will be taken into the tone of the world we are about to see: the floor consists of a plastered collage of old newspaper headlines, and the only set pieces are small, two-dimensional replicas of buildings in the New York skyline. Though the show takes place over a considerable period of time, we begin in World War I-era NYC, and the set design, courtesy of Carl Sprague, evokes this nicely. Director Bob Moss further sets the tone with a short opening movement sequence underscored by the overture, in which the ensemble rushes choreographically around the stage as buildings and street signs flurry around them. The busy NYC hustle and bustle builds into the law office of Fiorello H. LaGuardia (Austin Scott Lombardi), where we follow the little spitfire of a man on his journey from law to (and through) politics. Lombardi paints as empathetic a portrait of LaGuardia as possible, which is a definite feat considering the clunkiness and undertones of misogyny with which the book is riddled. One of Fiorello’s first major actions is to help female factory workers at the Nifty Shirtwaist Factory earn a living wage—obviously a very good thing. However the writing itself treats these women as incompetent and often whiny, which, from a modern perspective, does not sit well. Perhaps this sexism is simply a product of its time, but even with this production's haphazard efforts to cover it up, it can still be a little upsetting. Despite the problematic Golden-Age-style writing and the less-than-consistent dialect work, there are a few performances that stick with you after you exit the theater. 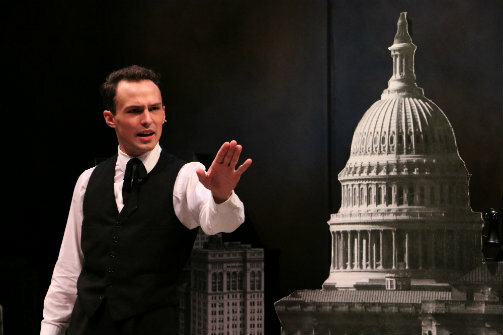 Lombardi’s Fiorello, costumed by David Murin in a large hat and overtly broad-shouldered suit jacket, is passionate, bold, and flawed, which makes for a more interesting story than the writing alone provides. Rylan Morsbach’s portrayal of district leader Ben Marino never fails to entertain, especially in the unnecessary but uproarious number “Little Tin Box,” in which he plays many larger than life characters being questioned in court trials of fraud. Because of the distance between LaGuardia’s political prevalence and now, I often found myself questioning why this story is relevant today. There are many references that were probably hysterical and biting in 1959, but to a modern audience, register very little. However near the end of the show, when James J. Walker beats LaGuardia in the mayoral election of 1929, the consequent army of ever-smiling blind supporters hits a little too close to home given the current political climate. So although it takes a little bit of effort and time to find the relevance of Fiorello!—why here? why now?—it is arguably there. All in all, this is a thoughtful and effective production of material that may feel dated in 2016. And it is certainly a visually and musically lovely piece of theater—the singing is close to flawless, the choreography (by Michael Callahan) works perfectly in the tiny playing space, and Bob Moss creates striking stage pictures that will surely delight and engage audiences. Fiorello! is by George Abbott and Jerome Weidman, with music by Jerry Bock and lyrics by Sheldon Harnick. Directed by Bob Moss. Music direction by Evan Zavada. Choreography by Michael Callahan. Set design by Carl Sprague. Costume design by David Murin. Lighting design by Matthew E. Adelson. Sound design by Brendan F. Doyle. Dialect coach is David Alan Stern. Stage managed by Chandalae Nyswonger and Shelby North. The cast is: Erika Anclade, John Barsoian, Katie Birenboim, Michael Brahce, Rebecca Brudner, Matt Caccamo, Drew Carr, Dan Cassin, Collier Cobb, Christy Coco, Maureen Glessner, Austin Scott Lombardi, Ana Lovric, Matt McLean, Kelsey Ryan Moore, Rylan Morsbach, Ben Dallas Redding, Julius Reese, Jessica Riloff, and Michael Sullivan. Orchestra: Alev Gökçe Erem and Robert Frost.